The incandescent Cliplight version was the first to grace our shores in 1988. The product incorporates very high-quality LED technology and is IP44 rated for use in indoor and outdoor applications. 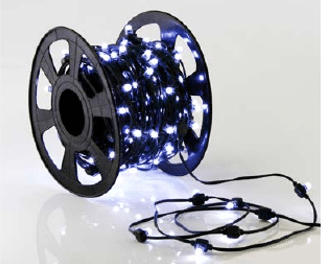 The LED cliplight comes in 50 mtr reels and can be easily cut and re-connected in any length(s). Originally designed with an incandescent bulb, the new and improved Cliplight is now supplied with an LED capsule providing an extended lamp life. 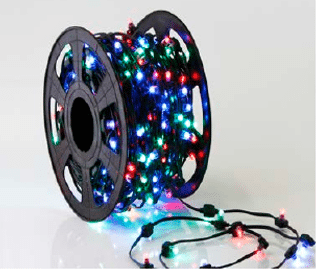 The LED Cliplight decorative lighting product has been used in countless decorative lighting installations, providing a beautiful, soft glow lighting effect. The LED Cliplight product is extra low voltage and UV stable and maintainable. It is capable of withstanding prolonged exposure to the elements. Limelight has supplied and installed the LED Cliplight product to enhance trees and building facades for local Councils, Day-care centres, Hotels and the general business sector throughout Sydney and the greater NSW region since 2000. LED Cliplight decorative lighting is a unique lighting product capable of transforming any garden into a softly illuminated, enchanted and magical space. Typical applications include indoor/outdoor decorative lighting, public festive lighting, underwater lighting, displays, theme parks, special events, temporary installations, gaming lounges, corporate theming.